(Washington, D.C.) – Thousands of government workers are just now getting back on their feet after going 35 days without getting a paycheck. In an effort to help some of those workers, WGTS 91.9 recently hosted the “Forget Your Furlough Show.” The Vertical Worship Band from Harvest Bible Fellowship in Chicago led worship and then comedian Nazareth had the audience rolling with laughter for the next hour. When he was done, the entire audience rose in unison and gave him a standing ovation. The day before the show WGTS teamed up with a local Northern Virginia foodbank called “Food for Others.” The station and the food bank spent 13 hours at the church collecting food from generous listeners. By the end of the day listeners had dropped off over 800 pounds of food and the foodbank added more. After the “Forget Your Furlough” show WGTS handed out the food to families that needed it. Each family got two bags filled with vegetables, meats, beans, rice, pasta, spaghetti sauce and a loaf of bread. In addition, there were tables where families could shop for other specialty items like snacks and baby formula. “WGTS talks a lot about being the Hands and Heart of Christ. I think we’re at our best when we’re bringing the community together to meet the needs of their neighbors. 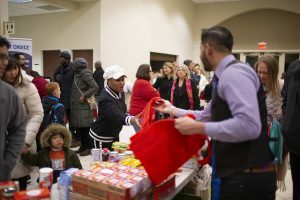 I think both the show and the food distribution provided a lot of hope for government workers,” said WGTS Program Director Brennan Wimbish.